“We are all on a bridge between earth and heaven to reach God,” says Sister Mary Roy Weiss, SSND. Her CD, “Bridge to Glory,” has a combination of scriptural and original lyrics combined with music she composed. Her songs run the gamut from Gospel to slow jazz, from songs for meditation to easy listening and have been enjoyed by listeners all over the world. The “Bridge to Glory” CD may be obtained from Sister Mary Roy Weiss, SSND, by sending a check or money order, made out to School Sisters of Notre Dame, for $13 ($10, plus $3 for shipping and handling for 1-2 CD’s) to 6401 North Charles Street, Baltimore, MD 21212-1016. 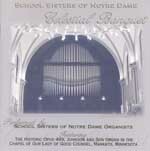 “Celestial Banquet” is an organ music CD recorded from the historic Johnson & Son Organ, Opus 499, in the Chapel of Our Lady of Good Counsel, Mankato, Minn. The recording includes performances by Sisters Elaine Fraher, Janis Haustein, Carol Marie Hemish, Lucille Matousek, and Helen Marie Plourde. The Johnson Opus 499 was built in 1877 for St. Mary of the Sacred Heart Church in Boston. When St. Mary’s building was slated for demolition in 1975, the School Sisters of Notre Dame rescued the organ and placed it in the chapel of their provincial house in Mankato. In 1994, the sisters committed themselves to a restoration of the organ, which comprises 45 stops and 2,995 pipes.